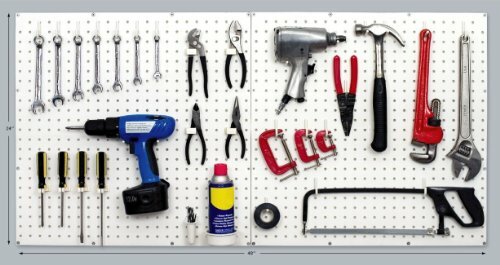 • WallPeg Pegboard is superior to all other types of pegboard - can be used indoors or outdoors - rain or snow it will never rust like metal pegboard. • Tuff Poly Plastic is scratch resistant, never needs painting, and is ready to mount right out of the box. • Pegboard is spaced from wall with molded ribs for added strength with attractive finished sides...no spacers or furring needed like other pegboards. • WallPeg Pegboard is reinforced flush mounted holes attach our pegboard to the wall, other brands use peg holes for mounting that can warp or damage the panel. • Your Best Amazon Deals on Pegboard, hooks, bins, and shelves...search WallPeg. If you have any questions about this product by WallPeg, contact us by completing and submitting the form below. If you are looking for a specif part number, please include it with your message.